(A) Ultrasound imaging of the patient’s right shoulder, shown here in this panoramic view, revealed multiple, round, mass-type lesions with homogenous echoes (arrows) and irregularly scattered hyperechoic plaques with acoustic shadows. (B) Ultrasound-guided aspiration was performed using the direct in-plane technique. The arrowheads indicate the needle. A patient’s odd physical presentation was the result of what could be termed a mineral deposit. The 40-year-old man reported that his right shoulder had been swelling progressively for more than 6 months. His medical history was significant for chronic kidney failure, and he had been undergoing hemodialysis for the previous 10 years. He had no other systemic diseases, such as diabetes mellitus, hypertension, rheumatoid arthritis, or gout. Further, he had no history of trauma. 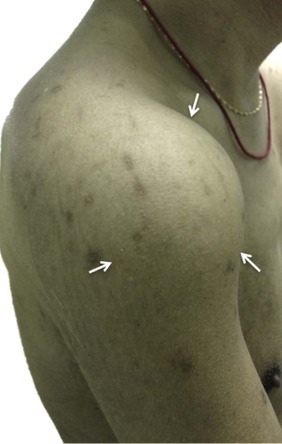 During the physical examination a firm mass was noted at the patient’s anterolateral shoulder (Figure 1). Yet he had no erythema or tenderness (Figure 1). His shoulder motions were free, and he had no motor deficits or sensory impairments. 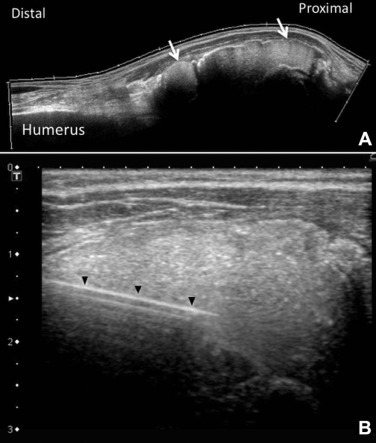 Ultrasonography revealed multiple cysts with homogeneous echoes and scattered irregular hyperechoic plaques (Figure 2A). Upon compression and decompression, free particles within the cysts were easily displaced and sent whirling. Ultrasound-guided aspiration was performed, and 38 mL of milky fluid was aspirated (Figure 2). Fluid analysis revealed no leukocytosis or crystals. 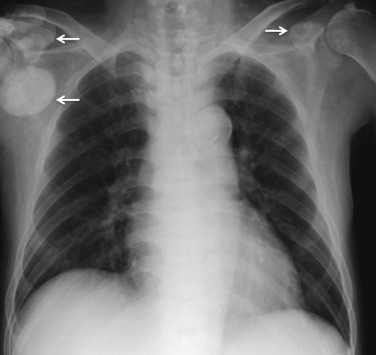 The patient’s medical records indicated that bilateral extensive calcifications, including small calcifications around the right shoulder, had been seen on a chest radiograph 1 year before this episode (Figure 3). The chest radiograph in Figure 3 was taken 2 days before the ultrasonography and revealed calcifications around bilateral shoulders, which were larger than the calcifications noted 1 year ago. Three years earlier, a chest radiograph showed almost no calcification. 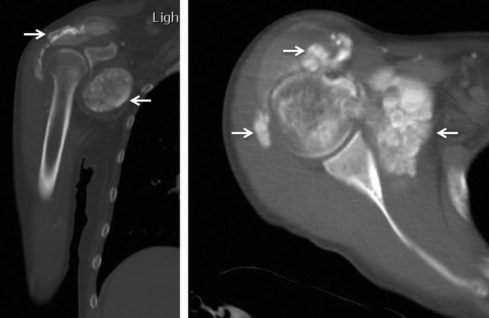 Computed tomography (CT), ordered after the ultrasonography, demonstrated bilateral multiple amorphous calcifications, some with fluid–fluid levels, around the glenohumeral joint (Figure 4). Laboratory tests yielded the following results: serum calcium level, 9.08 mg/dL (normal, 8.6-10.3 mg/dL); serum phosphate level, 6.6 mg/dL (normal, 2.5-5 mg/dL); alkaline phosphatase level, 360 U/L (normal, 34-104 U/L); and parathyroid hormone level, 1339 pg/mL (normal, 12-65 pg/mL). An ultrasound image of the parathyroid gland disclosed a growth that was suspected to be an adenoma.